During last month’s 50th anniversary celebration of Martin Luther King’s “I have a Dream” speech, much attention was focused on the range of areas where gaps between whites and blacks had widened, narrowed or stayed the same. One area where the black-white gap has widened is incarceration. Several speakers at the anniversary took note of this, including former President Jimmy Carter who said “I think we all know how Dr. King would have reacted” to the large numbers of African-American men in prison. Black men were more than six times as likely as white men to be incarcerated in federal and state prisons, and local jails in 2010, the last year complete data are available, according to a Pew Research Center analysis. 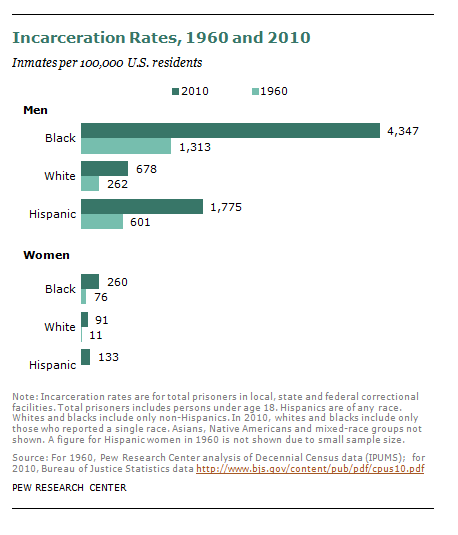 That is an increase from 1960, when black men were five times as likely as whites to be incarcerated. In 2010, the incarceration rate for white men under local, state and federal jurisdiction was 678 inmates per 100,000 white U.S. residents; for black men, it was 4,347. According to the Bureau of Justice Statistics, black men were more than six times as likely as white men to be incarcerated in 2010. In 1960, the white male incarceration rate was 262 per 100,000 white U.S. residents, and the black male rate was 1,313, meaning that black men were five times as likely as white men to be incarcerated. Note: The comparisons in this post regarding gaps between blacks and whites were made in the context of the anniversary of the Martin Luther King speech and reflected conditions in 1960 compared to now. While the gap between blacks and whites on this measure is larger than it was in 1960, it should be noted that black incarceration rates rose significantly during the 1990s and have declined since then to the levels cited here.